Get ready to wow your guests this season! Christina - you talkin' food and drinks now? I shole am, I shole am! Hopefully, y'all rock with me as I start mixing things up over here at The Mane Objective. For those of you that may be wondering why - listen. I've been running this blog since 2012, and virtually every topic you can think of regarding natural hair, I've covered to some extent. Hang with me as I spread my wings a lil' bit and start integrating more of who I am and what I love outside of hair into this here thing. As you probably know, I'm really into creating a healthy lifestyle for myself. Healthy isn't just about eating right or working out - it's about balance, spiritual wellness, and mental health, too. And while I'm always down for a sweet glass of wine or pomegranate margarita with extra limes (because that's how I roll), I like to make sure those are weekend treats here and there - so as to not derail me from my goals (and dry out my skin). But that doesn't mean I don't mix it up! And if you're hosting get-togethers this spring and summer (hi Easter/Resurrection Day, Mother's Day, Memorial Day, Grad Parties, Father's Day, and 4th of July), you gotta go hard or go home in the beverage department. Why not use these opportunities to introduce your peeps to some healthy, refreshing, pretty to look at (aka highly Instagrammable), and great tasting non-alcoholic cocktails? I mean of course, you can add a splash of liquor to these recipes if you like, but trust me on this one - if you keep 'em virgin, you won't even miss the alcohol. The three cocktail recipes I'm going to share were inspired by the new Eden BodyWorks Citrus Fusion Collection. Yep - the line that smells of bright, refreshing goodness and is packed with amazing ingredients like lime, orange, coconut, acai, sea kelp, and quinoa. The products smell just like you'd imagine this picture to smell - bright and beautiful! The moment I sniffed each product, I knew exactly what I wanted to create - and I couldn't wait to share. In this video, you'll see me craft each drink by hand. The full recipe and step-by-step direction for each mocktail follows. I have to thank Antoinette of Sup x Dine and The Flatlay Photog for collaborating with me on videography, photography, and creative direction. There's no way I could have done all this on my own! So without much more delay (because I hate super chatty recipe intros and backstory lol), let's get to cocktailing! Easily my favorite drink of the list. It's tart, slightly sweet, with the perfect hint of lavender. This recipe is inspired by my favorite drink from Pressed Juicery and has the same benefits, with a much cheaper price tag. Thanks to this recipe, I'm no longer pressed to go to well, Pressed. 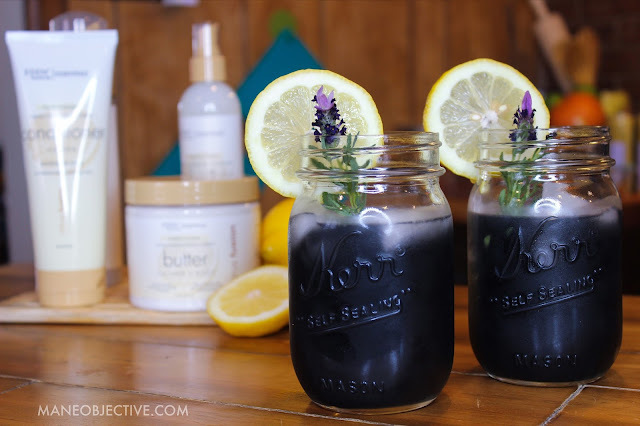 Activated Charcoal adsorbs toxins and chemicals, helping to detoxify and removes impurities from the body while alleviating bloating, joint pain, and inflammation. Lavender balances blood sugar, restores skin complexion, is packed with powerful antioxidants to reduce aging, and helps improve eczema and psoriasis. Lemon stimulates the digestive system to help flush toxins, and 1 lemon gives you your daily recommended dose of Vitamin C.
Fill your pitcher with 2 cups of cold water. Squeeze or juice the 3 large lemons, and add to pitcher containing water. Set aside. Make your lavender-infused simple syrup by combining 1 cup water and 1/4 cup sugar and bringing it to a boil. Once the sugar has completely dissolved, add 5-7 sprigs of fresh lavender and allow it to boil for 2-3 minutes, or to your desired strength. Strain the lavender-infused simple syrup into a separate container. It will look light green, which is normal. Should yield approximately 1 cup of lavender-infused simple syrup. Add lavender-infused simple syrup to pitcher. Add 1 teaspoon activated charcoal to pitcher and stir. You can use loose powdered activated charcoal, or open up capsules like I did. It's all the same. Add ice to pitcher and stir. The longer you leave the lavender in the simple syrup, the stronger it gets. I don't recommend exceeding 4 minutes, because then you're headed into soap and perfume territory. For added sweetness, gradually add more sugar or honey. The drink tastes best when served day-of. I don't recommend storing it for more than 3 days in the refrigerator. A refreshing twist on regular, degular coconut water! This light, breezy refresher comes with a bright boost of lime, and a hint of pineapple to balance the salinity of coconut water. Muddled mint rounds out the refreshing factor on this drink, and brings the sweet-salty-sour flavor together beautifully. The Coconut Lime Cooler is perfect for a hot, sunny day and can even be used as a post-workout drink to restore electrolytes. Coconut water is rich in electrolytes and b-complex vitamins, which restores hydration to the body and boosts high your energy and metabolism. Coconut water is also rich in fiber, helps lower cholesterol, and has amazing anti-aging properties for skin. Lime gives your body an immune boosting blast, thanks to rich Vitamin C content. Limes are also rich in alkalizing compounds that help alleviate inflammation in the body. Pineapple is rich in Vitamins C and B6, along with manganese to boost the immune, free-radical fighting, and self-regulating functions in the body. Pour coconut water into serving bottle or pitcher. Zest 1 whole lime, set zest aside. Squeeze or juice 2-3 limes (I used 2.5), and add to pitcher or serving bottle of coconut water. Pour pineapple juice into the serving bottle or pitcher. Shake or stir to thoroughly blend ingredients. 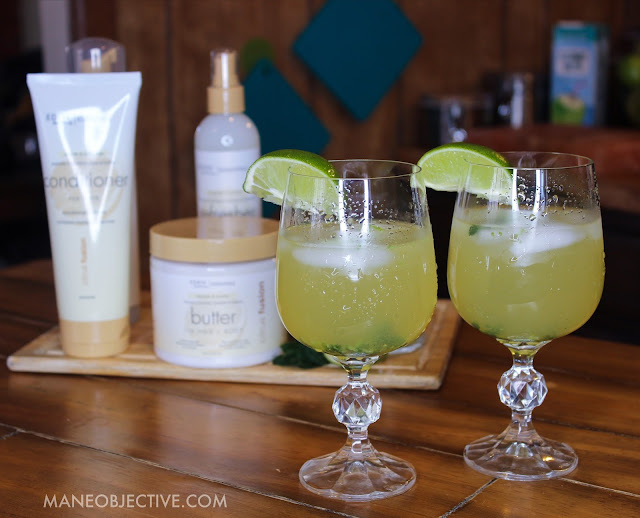 Cut mint leaves from stems and place in the bottom of glasses. Muddle the mint using a muddler, or the bottom of any blunt kitchen object. I just used the end of a wooden spatula. If you're not a fan of coconut water, you won't care for this drink. But if you love coconut water, you'll love this! You can kick this drink up a notch by mixing in flavored sparking water (to keep it healthy), or turn it into a sugar-laden punch with 7-Up or Ginger Ale. It's delicious either way! This was by far my favorite to make and look at. Again, shoutout to Antoinette for giving me the idea to add grapefruit peels to the simple syrup mix. #nextlevelish If you love combination sweet, salty, sour, spicy like I do, then this drink is right up your alley. Of all the cocktails, this one is the easiest to booze up with your favorite tequila. Slice and peel skin from 1/2 grapefruit, set aside. Slice 4-6 rings of jalapeno. You'll want to start off this recipe by getting your jalapeno and grapefruit-infused simple syrup going first. In a small saucepan, combine 1/2 cup water and 1/2 cup sugar and it to a boil. Let the sugar dissolve completely and boil down for approximately 10 minutes until it's nice and thick. At this point, add 4-6 slices of jalapeno and grapefruit peel to the simple syrup, and allow it to infuse over the flame for 2 minutes. For more heat and intense flavor, boil together for an additional 1-2 minutes. Strain the simple syrup and set the jalapenos and grapefruit peels aside. Add ice to blender. Squeeze or juice 1/2 grapefruit and 2 limes and pour over ice. Add pineapple juice to blender. Pour jalapeno and grapefruit infused simple syrup into the blender. Cover blender and mix thoroughly. Slice remaining lime half into wedges. Pour out Tajin on a flat, dry surface. Use lime wedges to create an adhering surface around rim around the serving glass. Press and rotate glass around the Tajin to create the rim. This drink is mellow and on the sweet side, thanks to the added sugar in the simple syrup and the pineapple juice. To dial back on the sweetness, reduce the sugar in the simple syrup, or add more grapefruit and lime. For an extra kick of citrus, garnish with lime zest. The fragrance alone will make the drink feel more tart. 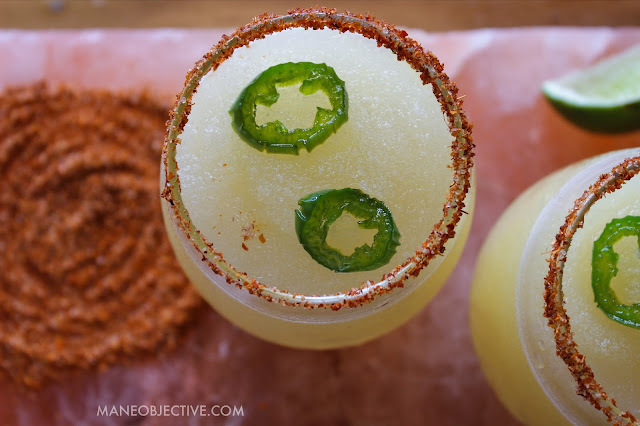 For stronger jalapeno flavor, blend into the drink directly. 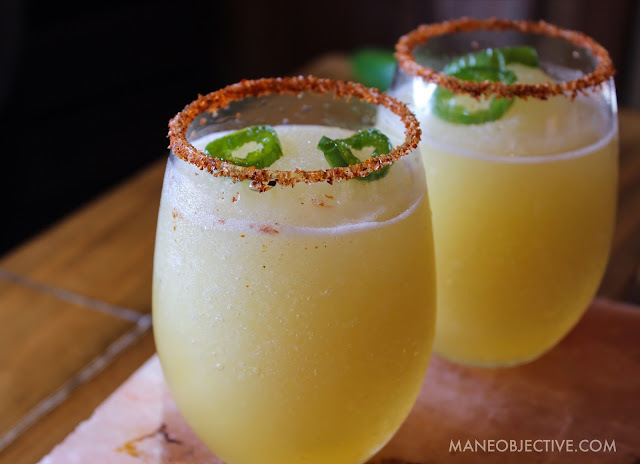 If you love that bite that tequila gives a margarita (like me), stir some Tajin into each glass before serving. Trust me on this one. Well ladies (and maybe gents) - I hope you enjoy these citrus infused recipes inspired by the new Eden Bodyworks Citrus Fusion Collection. Let me know if you're going to craft any of them at home! 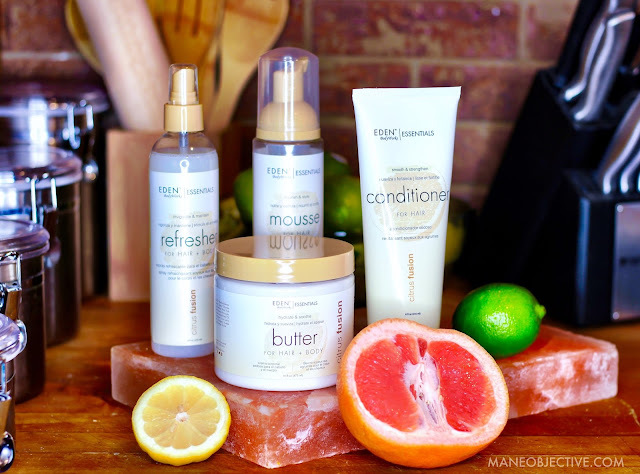 details for the style I created with the Citrus Fusion Collection - again, inspired by fusions! Per the FTC, I have to let y'all know that this post and video is sponsored by Eden BodyWorks. Also, there's some affiliate links for Amazon and/or Target in this thing - so I can collect a few coins if you so happen to click my link and order. Y'all don't mind, right? Even though this content is sponsored that doesn't mean anything - I'm still keeping it 100 and giving you guys the real. Of course, all the drinks looked delish! Congrats on trying something new on the blog. Drinks will helps you to boots to your energy. It's gives you the stamina to do more. You can take supplements as your drinks. In summers, drinks are the best source to keep body fresh and hydrayed as they give your body, a great boost-up to stay fresh and active. Though alcohols have might be used for changing the taste of ylour taste buds but apart from this there are many beauty benefits of alcohol. Sake that is quite popular in Japan is used as a toner for the skin. Apart from this there are many alcohols are available that are quite useful for your beauty.